Blog by Dr Duncan Edwards, GP and doctoral research fellow at the Primary Care Unit. first published on the Primary Care Unit website. My local undertakers are having a busy year. And it’s not just me that’s noticed this. GPs make routine visits to undertakers, to confirm the dead are legally fit for cremation, and we have learned only to ask the question “Busy?” of our undertaker colleagues out of rhetorical sympathy. We see undertakers struggle to find free bookings at crematoria and keep bereaved families happy. What is driving this busy-ness? An ageing population? Nasty winter flu strain? Chance? Will the oncoming winter be any easier, or is the UK’s remarkable record of life expectancy increasing by almost 1 year for every 4 years of history since the mid-nineteenth century coming to an end? Some of the increase in the death rate is due to an ageing population – it has been long expected that with a larger elderly population, deaths per year in the UK would start to increase, even if life expectancy continued to increase. Annual variation in the extent of winter illnesses, particularly flu, can also explain a spike in deaths in any particular year, and may be a good explanation for the increased death rates in the winters of 2014-5 and 2017-8. However, there are also suggestions that life expectancy improvements are stalling more generally, and that the “bad winters” for death rates are not being adequately recovered in subsequent years. 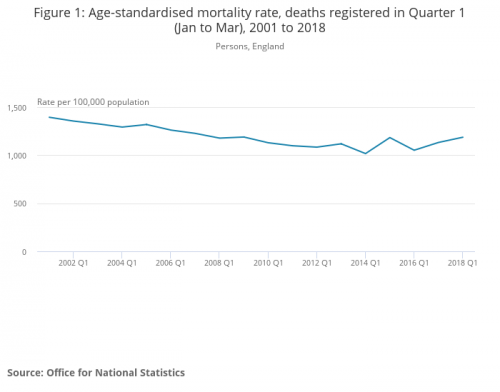 The age standardised mortality rate for the first quarter of 2018 was the highest since 2009. It is not clear why life expectancy improvements might be stalling, and the topic is the focus of increasing political and academic debate. The King’s Fund has just published an exploration of life expectancy trends and potentially relevant factors here; and the BMJ discussed the topic and published two new studies about trends in life expectancy this week. Commentators are speculating on causes. It remains the work of the Primary Care Unit here at Cambridge to understand and help address the causes of premature death. Dr Duncan Edwards is a National Institute for Health Research doctoral research fellow at the Primary Care Unit, and a GP in South Norfolk. His research is focussed on the prevention and treatment of stroke and cardiovascular disease in the primary care setting.